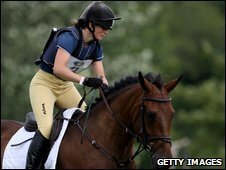 Piggy French has been called into the British eventing team for the first time for the European Championships. Leicestershire-based French, who grew up in Norfolk, replaces Mary King and will ride 14-year-old Some Day Soon. She was stunned to be called up by GB manager Yogi Breisner for the event starting in France on 25 September. "He asked if I'd go as an individual, I asked if he was having a laugh, he said he doesn't laugh at these situations," the 29-year-old told BBC Radio Norfolk. "I jumped up and down, there were a few tears, it's just a dream." French has always cited King as one of her sporting heroes, so she is trying to remain measured in her ambitions when replacing the four-time gold medal winner. "I'm not in any way expecting to go there and give them all a run for their money, but I'm going to give myself and the horse the very best chance I can," she said. French is currently fourth on the British Equestrian 2009 leaderboard and will join partner Oliver Townend, who won the Burghley Horse Trials on Sunday, in the GB squad.